One of them is bad. But that's okay, I guess? Behold some of the latest Lightning Returns: Final Fantasy XIII downloadable content. Today, Square Enix launched the first round of DLC for the game. 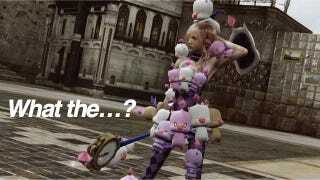 The outfits, which come with weapons, are The Divine World's Saint Clothing Style, The Final Liberation Clothing Style, and, wait for it, The Moogle Lover Style. Below, you can see the outfits, courtesy of 4Gamer. Moogles are those little critters all over Lightning. Each is priced at 400 yen (US$4), while the full set is 1,000 yen ($10). No word yet on a Western release.